Yesterday I went to visit my parents for lunch. My Mom is a creative person who has taken up quilting in the last few years so whenever I get ready to leave I have her show me what she's been working on. After looking at her lovely handwork she pulled out this quilt top. She told me that her sister-in-law had given it to her. I told her I would take it home and try to get some of the stains out. I want you to see a close up of the cream and black fabric. What a neat pattern. I don't know how old the quilt is but his reminds me of some reproduction Civil War fabric I once used. 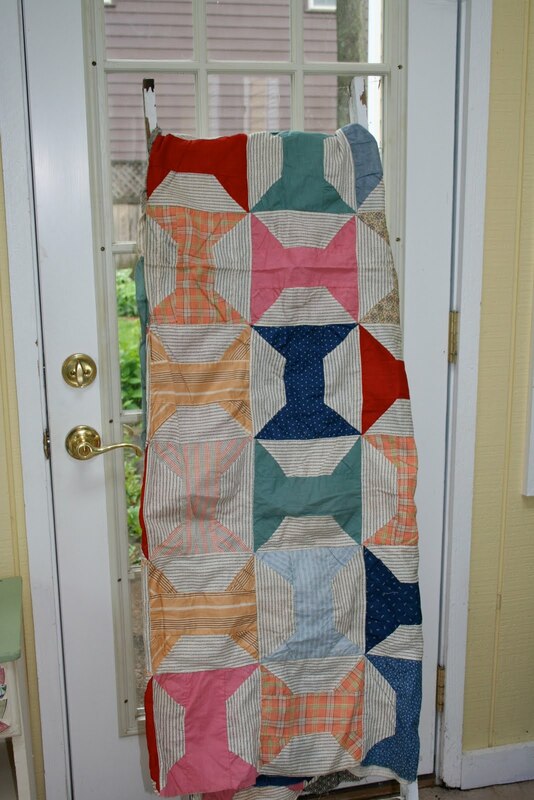 I started thinking about old quilts and pulled out a quilt my Grandmother made. She passed away while I was in college and I remember asking if I could have this quilt. I didn't learn to quilt until many years later but am so thankful that God prompted me to take this because I can truly appreciate it now. This quilt is a testament to a hard working farmer. My Grandmother had some difficult times being widowed twice at an early age. 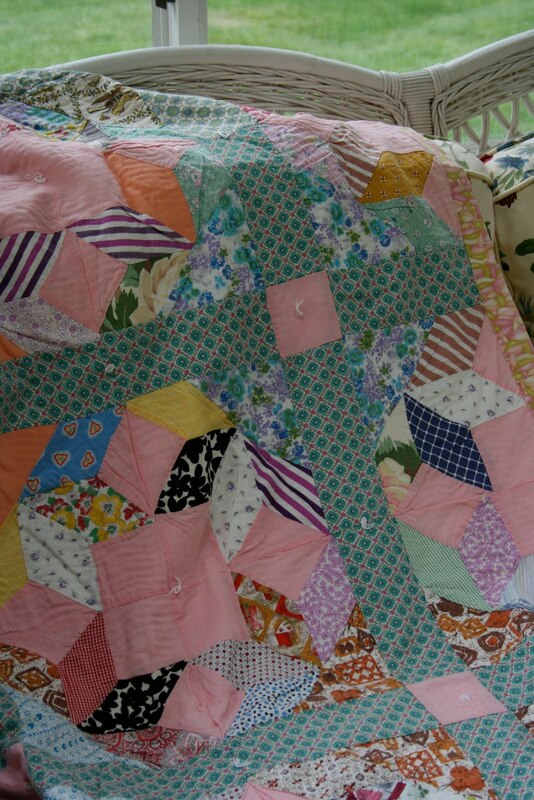 This quilt was made with scraps of her shirts that I remember her wearing when she worked the garden in her big straw hat and hoe in hand. It is not constructed particularly well but I love that she kept working at it anyway. It has an old chenille bedspread inside for batting, and is tied instead of quilted. I want to share with you an excerpt from the book, "Quilted with Love" by Debbie Stalter Goodwin. the good of those who love him. Recycle life in more ways than one. To create a pattern from discards. dark pieces nor the ones too small for anything else. a quilt than painting a picture. some so precious I can hardly stand to part with them. What a beautiful quilt and a sweet memory of your Granndmother! You will have to tell us more about her, because I don't know the Grammy stories. From the decription of her out in her garden, she reminds me of someone...Hmmmm...I wonder who? 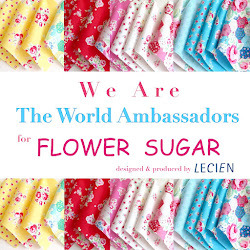 Thanks so much for your lovely blog. I was happy to feature your blog today, on my own. Having something like your grandmothers quilt really connects you to her, especially since you sew too. I have a quilt form a great grandmother and I found a quilt top at a yard sale that I plan to finish because it is just so beautiful. All that work should not go to waste! hearth-warming than an old quilt! 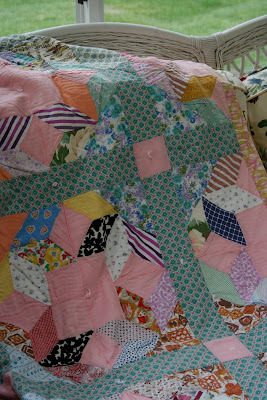 I love old quilts when they are not perfect. Having memories of your Grandma wearing clothes that are in the quilt is especially nice. I will have to look for the book you quoted from. Thanks for sharing your old quilts. They do tell a story if you look for it. Your quilts are all very pretty! How lovely that you have a quilt your grandmother made, what a sweet story to go with it! The excerpt from your book was so beautiful written too...:) thanks for sharing.